Several years ago we were speaking in Washington, D.C., at a national marriage conference. With two hours of unstructured time one afternoon, we caught a cab and made our way to the Smithsonian Institute to view one of our nation’s most prized documents, the Declaration of Independence. He proceeded to tell us how each night it is mechanically transported into a huge vault sunk deep beneath the ground of the museum. But can it really? Can love safeguard your husband or wife from pain? Not really. To guarantee such a promise is absurd. But love can protect the one you love from walking in pain alone. In fact, some of life’s most piercing pain comes from not having a companion who walks with us. The Latin origins of protect literally mean to cover over or walk in front of. And that’s just how love’s power to protect works. It moves us to carry our partner’s pain as if it were our own. It compels us to cover our partner with companionship. Consider the painful times in your own life. Didn’t the most dramatic relief come when someone entered your situation with you and helped you carry your burden? This person literally protected you from further pain by carrying some of it away. Because of his or her love, your pain became less difficult to bear. And to take it a step further, love not only protects us by reducing our pain, it protects us by enabling healing to begin once the pain is present. In other words, love protects us from letting an emotional wound fester with anger and resentment. Love knows how to keep its mouth shut and just listen. Love creates a safe place to talk it out and thus protects us from doing something foolish. Love keeps us safe by its very nature. It is a foolproof security system. It wraps us in acceptance and guards us in its embrace. When we are loved — when we are wanted, claimed, and enjoyed by another — nothing can hurt us to the core. 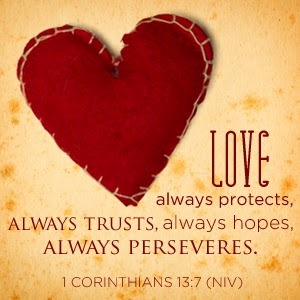 Because love always protects. Excerpted with permission from Love Is: Meditations for Couples on 1 Corinthians 13 by Les and Leslie Parrott, copyright Zondervan.